"I have known Pam since I was born. She was older but always..."
"There really are no more words to add to the wonderful and..."
"Rest In Peace my friend!" "Pam and I have known each other since early childhood. Our..."
"My very deepest sympathy to all of the family and friends...."
YARMOUTH - Pamela Soule Johnson, 77, of Chebeague Island and Yarmouth, passed away peacefully on Nov. 4, with her family by her side, just as she wanted. 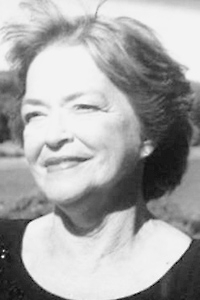 Pam went to elementary school on the Island and graduated from Portland High School in 1959. In 1985, she became a successful real estate agent, retiring in 2007. Pam raised her children on the island, later moving to Yarmouth. She bought her home in 1992 and it has since been our port in any storm. Pam spent her time taking care of her family. You would often find her driving her grandchildren and great-grandchildren to school, sports or the boat. She called us all regularly and sent texts to check in. Her refrigerator was always covered in pictures and we rarely left her house without a cup of tea and something to eat. If you wanted to stay the night at her house, you had to make sure there would be an empty bed because there rarely was one. She made the best popcorn and put on the most amazing tea parties.Pam was incredibly proud of her children and expressed it regularly. She had a love for her family that never wavered. Even in her last hours she smiled at the sight of us and told us all how much she loved us. She made loving us her life's work and we never had to wonder what we meant to her. Pam often expressed how fortunate she felt to have a close, healthy family, but we know we were the fortunate ones. She is remembered for her lifelong beauty and selflessness.Pam was predeceased by her parents, Sherman and Eleanor Johnson; and a son-in-law, Winthrop Houghton Jr. Pam is survived by her two brothers, Peter Johnson and Stephen and Beverly Johnson; her six children and their spouses, Chris and Jill Rich, Kim and John Martin, Patti Rich, Sherman Rich, Jon and Amy Rich, Rebecca and Jim Koppmann, and a stepson, Craig Campbell and his wife Kim whom she thought of as her own. Her 15 grandchildren and their spouses, Stephanie Martin, Danielle and Shawn Rideout, David Rich, Brad and Anna Martin, Chris and Sara Martin, Nate and Sarah Martin, Brennah Martin, Stephen and Elias Rich, Braeden and Zach Rich, Hannah and Nicholas Koppmann, Catherine and Carly Rich. Six great-grandchildren, Drea and Brian Rideout, Finn and Maggie Martin, Jack Martin and Henry Martin; and many nieces and nephews. She is also survived by her lifelong friends, Kenny Campbell, Phyllis Hoag, Joyce Burns, Mary Cushman and many more. Too many to name. A service will be held at the Chebeague Island Methodist Church on Tuesday, Nov. 13, at 1 p.m. There will be transportation to and from the boat on the island. There will not be any visiting hours. Please visit www.advantageportland.com to sign Pam's guestbook and leave memories and condolences for the family.In lieu of flowers, please make donations to the Barbara Bush Children's Hospital.